Dina Slaibi is the Course Officer for MSc Aviation Management Programmes and Office Manager. 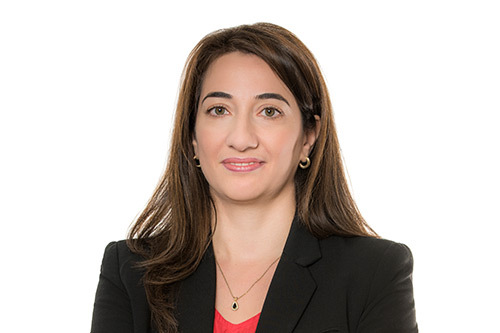 Dina Slaibi has 11 years of experience working with highly reputable universities in Dubai. She graduated from Bethlehem University with Bachelor of Business Administration (BBA). Dina started her career in sales and marketing at Al Bashir Drug Store in Palestine and then moved with her family to the USA and worked as teacher aid at Saint Lawrence Catholic School. In 2006 Dina moved with her family to Dubai and worked at the American University in Dubai as Special Assistant to the Library Director until 2010, when she joined City, University of London as Senior Dubai Office Coordinator. Dina worked within a team responsible for handling all aspects of administration for the Dubai office and also worked closely with Cass MBA Team in London and the academic staff to support the services provided for current students & potential students at all points. In September 2017 Dina was promoted to Course Officer for MSc Aviation Management Programmes and Office Manager. This dual role has enabled Dina to broaden her perspectives, manage her time and be a team player by bringing both aspects of the two roles together. Throughout her years in the education sector, Dina had the opportunity to engage with people from diverse cultures and backgrounds which enabled her to broaden her horizons and enrich her experience. Furthermore, Dina developed a variety of relevant skills such as time management, communication and presentation skills, as well as teamwork. Dina is fluent in English and Arabic. In her spare time she enjoys cooking, swimming and listening to music.